Size: 4.4" x 2.6" x 0.55"
All models shared the same design idea of a round "light pipe" to collect the ambient light and travel it to the high efficiency solar cells. The LOOK series of calculators received an award for its outstanding design from the German HIF (Haus Industrieform Essen). 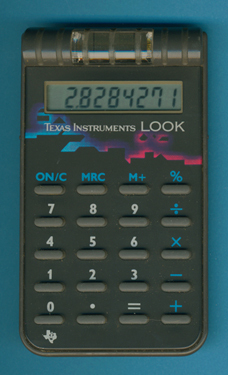 The TI-702 could be called the successor of the TI-1104 introduced three years ago. © Joerg Woerner, September 20, 2002. No reprints without written permission.